Michael T. Young: Thank you, Richard, for agreeing to an interview. Your latest collection, A Tide of a Hundred Mountains, opens with a poem that poses a problematic relationship to objects of desire. Other poems in the collection seem to touch on questions of desire in some way, such as “Evolution?” “Hands I Watched,” and “Trick or Treat.” Could you comment on the exploration of desire in the collection and what you see as its role? Richard Levine: I’d say that to the extent that the book is concerned with desire, there’s one object of desire, and that is my life, what I’ve experienced. Each poem is an exploration of how I’ve attempted to embrace what is given. While desire of the flesh is most gripping (sic), the drive to act well in the world is more enduring and more difficult. And what does it mean to act well in the world? How do we give that value in a poem? Look at the two veterans in “Disturbing The Peace.” They’re in a bar and one suddenly starts telling a horrific story that’s haunted him for decades, and he’s shouting, losing control. His friend shuttles him outside to protect him from the scrutiny of others at the bar, and to listen to him. Just as in war, they’re still rescuing each other. Similarly, in “Fences Down” another vet is having a PTSD episode that drives him into the woods in the night and rain. Is it a literal or figurative forest; and the storm? By morning, emerging from the forest, he wonders “why a storm is his to carry.” His desire is to be more stable, but unlike the two vets in “Disturbing …” he’s alone in his struggle. In “Picket Fences” a young white man sees racism through the eyes of a black girl friend. They’d both desire an end to prejudice, but their subjectivity to it is very different. And there are fences throughout the book’s poems that keep us from or protect desires. “Parallel Universes” is a funny parallel to “Picket …,” because two people appear to be looking at the same thing but what they chose to focus on is very different – it’s their desires that are different. You and I both read and write poems, but probably are satisfied by different gifts within them. Michael T. Young: Many of the poems in the collection seem to seek the heart-truth of a situation. I’m thinking of poems like “Equating Love,” “Late Hour,” or “Measuring Absence.” Many of these bear witness to our conflicting emotions. For you, what is the significance of this conflict in your poems? Also, what does it mean for us – people in general – in trying to do what is right in the larger world you often confront in your poems? Richard Levine: James Baldwin, in The Fire Next Time, said ‘Most people know the right thing to do, but they don’t act on it.’ So, for me, one of the most important things about being in the world is to act for the right reasons. This sounds moralistic—well, why not. What are we here for? We’re living in a time when avarice, cruelty, and violence are out of control, worse, they’re in vogue ... being a psychopath is in, man! Gordon Gekko was not our generation’s Scrooge, he’s an example of and role model for the Koch Brothers, the Donald Trumps, the Sheldon Adelsons, the IMF, World Bank and a journalism and world view that makes the global economy more important than global warming, war more meaningful than peace, information more valuable than knowledge. People who want to earn their living by doing things that make the most difference or contribute the most are looked down on by those who want to make the most money or insatiably acquire the most things. Writing can be one way of acting against this psychopathic age of raging greed. I consider myself an activist, and when social confrontation becomes an occasion for a poem that’s great. Michael T. Young: In the poem “His Own Missouri,” it says Meriwether Lewis “wrote of how beauty and violence wed, in the blind plunge of waterfalls.” Do you find this yourself in nature? How do you situate man in his relationship to nature with that mix of beauty and violence? The week of Tropic Storm Lee, which was about a week after Hurricane Irene, I was in upstate New York which was devastated—farmers crossing crop fields in row boats, propane tanks hanging from telephone poles, bridges crushed by collections of downed trees that had been swept along. I tried to get into town, but couldn’t, rapids were running over all the roads. It was frightening. I sat in a house whose walls and windows strained and at times made me wonder if they could hold as long as the storm might rage. The power was out. At night, there was thunder and lightning, and the lightning was like heat lightning that strobed almost continuously. It was eerie, like the whole sky was an eye opening and closing every few seconds. I’ve been through monsoons, but never experienced anything like that. The beauty and violence Lewis saw was an expression of how nature evolved to keep itself in balance, what I was watching was nature’s expression of being out of balance. And if scientific models are right, ‘we ain’t seen nothin’ yet!’ We don’t have to be poets to see our jones for oil as a destructive desire and addiction. Michael T. Young: Your poem “Trick or Treat” portrays Halloween as a kind of holiday that indoctrinates children into a culture of greed and gluttony. The poem recalled to my mind Wordworth’s “The World is Too Much With Us.” I’m curious what you see as the antidote to that gluttony, our cultural exaltation of “greed as good.” Or even our still unquestioned belief in perpetual growth, which is also a form of greed. Richard Levine: Not raising our kids to be Gordon Gekko is one action we can take. I couldn’t help thinking after the Sandy Hook school shooting that even in the face of that there were humans somewhere who were thinking: this’ll be good for business, just lay low until the grieving’s over. And, in fact, it has been good for business. Sales of assault weapons are on the rise since then, and this has been true after most mass shootings. And to fuel the sales and rabid paranoia the wingnuts from FOX and on Limbaugh and Hannity are talking about the possibility of Obama refusing to leave office, suggesting that he’s got the military and law enforcement under his command … I don’t think it’s a coincidence that they’re beating this drum while some leaders are trying to promote a civil and serious discussion about gun control. One of the constants of our constitution is the amending of its amendments—so who hallowed the ground around the Second Amendment? Certainly not soldiers or police. My money’s on the gun manufacturers. It’s a challenge for how to act in the world, we need to pressure our leaders and they have to enact laws—and, of course, the wealthy psychopaths are going to act to protect their profits. William Stafford had a line in one of his poems about being concerned about how to hold his wings in response to some crisis. And I always thought he got that idea from Akhmatova, who also employs a similar image. I believe they were both thinking that we are or have the will and power to be the angels that save ourselves, and through that the world. Like the Talmud adage: To save one person is to save the world. Michael T. Young: The closing poem of the collection, just like the opening one, has the image of snow in it. The closing poem also bears the line from which the collection takes its title, A Tide of a Hundred Mountains. The title and the poem gave me a sense of location within the larger arcs of geologic time. I wondered if this was your intent and, if so, if you could comment on that significance within the collection’s concerns with desire and shared responsibility. 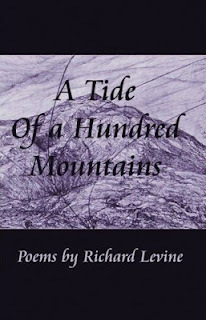 Richard Levine: The first poem involves a young boy playing in the snow and the last poem an old man on a playful sort of pilgrimage in the snow “…carrying his own kind of hunger.” He looks out on “a tide of a hundred mountains” that were once the bottom of a lake. So there’s all these different measures of time: the lifetime of years between the boy and the aged man, but also the time between hunger and fulfillment, the trees he hikes among growing by annual rings, the geologic time for the mountains to amass. The poem opens with the image of a hawk circling—snowball?—and closes with it diving after prey “from daylight to the dark,/immaculate feet of the forest.” And just before watching the hawk’s dive the narrator wonders “What has he found/that he believes in…” And throughout the book there are time markers: anniversaries, holidays, evolution, the time it takes to ‘become the bearer’. What’s it all mean? Who knows? What are we here for? Michael T. Young: You are politically active or at least a politically concerned poet. We’ve exchanged e-mails on topics mostly related to hydraulic fracturing. What do you see as the poet’s role in the framework of his country? Should a poet be politically active? Should that influence what he writes and, if yes, how? Richard Levine: This poet should be politically active. I feel strongly about it, and I think it influences my thinking and writing. But I never sit down and think I should write a poem about fracking or climate. You ask what I think a poet’s role is in their country, I’d say write as truly about what they’re experiencing, what it’s like to live where they do. Didn’t they lock Brodsky up because he was more interested in his day to day struggle than the feats of the ‘system’? He has a poem, a sonnet, I think, and the first stanza is about the nuclear arms race. In the second, he imagines that one the day nukes start flying he’ll go across the city to his lover and hopes scientists a thousand years from then will find them locked in each others’ arms. Beautiful. Is it political? Does it tell us how Brodsky acted in the world in which he lived and what it was like? Will it be read a thousand years from now? Michael T. Young: You are also a great lover of jazz. Do you feel this love has influenced your poetry and if so, how? Richard Levine: Music brought me to poetry, beginning with rock n’roll and blues. Chuck Berry and Buddy Holly, Robert Johnson and Muddy Waters made me want to write in rhymes that were physical, about all that goes on between a man and a woman … and an automobile … I was a kid and didn’t know about any of that, so it was all exotic and exciting. Concision is the great lesson lyrics and musical phrases continue to teach me, the electric emotion one note or one word can deliver across time and space and make you quake at its expression, in a concert hall or in your living room, or pouring tin and static out of a car radio or from a transistor radio under your pillow when your parents think you’re sleeping. By the time I was listening to classical and jazz I was reading poetry and that opened more possibilities, including the idea that anything you could or could not embrace in the world could be a topic for a poem. Richard Levine: I think “Disturbing The Peace,” because there’s so much pain veterans carry and since WWII they haven’t had to do it so much for a greater common good, but for narrow interests and profit. The way we treat or ignore them when they return is even criminal. The largest demographic populations of homeless are Vietnam vets, my peers. There are over 56,000 names of American soldiers killed in Vietnam on the memorial wall in DC—none of the MIAs or Vietnamese. More than twice that number of Vietnam vets have committed suicide! More than double! The fastest growing demographic of homeless are the vets of Iraq and Afghanistan, and their suicide rates are already outpacing those of Vietnam vets. How can we continue to watch all this degradation and deterioration of people and our environment, and in the name of profit? And the military is no longer democratic; this all volunteer army is a troubling feature of the increasing distance between the haves and have-nots. I oppose war, in general, but if we are to go to war I think we should require the support of a majority of the people, who must be willing to fight and/or send their children to fight. George Orwell said, observing his own time but it seems to fit well now, too, that the middle class helped capitalism, which is just a form of fascism by another name, to replace the democratic state. I’m also disgusted by current journalism that no longer covers war. Why? Who made that decision? And today the Times announced that they are disbanding their environmental reporting staff. How could they do that just when politicians are beginning to talk about climate change? How will we know? So we have no reporting and only the poor have to go to war (because there are no other jobs because of outsourcing). And soon, if the Times has its way, no environmental reporting as the world tilts toward the escalating cycle of biblical storms. When you think about that you have to ask: A free press? A democracy? I like to think that the poem addresses some of these issues, and that poetry can move us physically and emotionally to feel the desperateness of our situation in ways that an article, report, statistics, or a rant never will—it delivers that wedding of beauty and violence that exists beyond the syntax of reason. A few times in this interview I’ve posed the question, what are we here for? I don’t want the answer to be self-annihilation, taking down armies of other innocent species with us. That’s something worth acting against. Richard Levine: I don’t know how it’s influenced my poetry, other than giving me additional models for saying things well and true. I read a lot of nature/science writers from John Muir, Aldo Leopold, and Wendell Berry to Bernd Heinrich, Hal Borland, and E. O. Wilson. And love nature guides. Then there’s social commentary, Charles Dickens, Mark Twain, George Orwell, Woody Guthrie, Kurt Vonnegut, Joseph Campbell, Emerson—or should he go in with the nature writers? And where does Michael Pollan go, food writing? It’s as much science. M.F.K. Fischer. Oh, and great writers who are great reporters and talkers: Studs Terkel, Jimmy Breslin, Pete Hamill. And David Howarth, if only for 1066, which is extraordinary but what genre, history, history with fictional structure, historical fiction? I’m not big on literary criticism or theory, but Brodsky’s Homage to Robert Frost includes a painstaking explication of “Home Burial” that you could cry reading. And William Stafford’s Deep Down in My Heart about his time in CO camps. More ‘witnesses,’ Primo Levi, Elie Wiesel, Pete Seeger. And like all the unsung poets in journals, all the unsung article writers in a million magazines that help us know and understand what life is like in other skins and other places on this planet. George Carlin had a great line about how the planet would survive our ecological crisis, where we are the petard hoisters: “The planet’s going to shake us off like a dog with a bad case of fleas.” Then, he’d stick out one leg sideways and shake it. Richard Levine: It’s all related to writing poetry, because that’s part of how I find myself, even at 65. Now that I’m retired I have time to do more things, and I find that, I do best and enjoy myself most when I do what I did as a kid: read, play music, draw, run. Activism takes up time in spurts, but it’s almost daily. I keep a pretty ambitious food garden in summer, which I call a pot garden, because everything I grow there has to go in one pot to make pizza and pasta sauces. And, of course, lots of poems are grown there, too. I’m also trying to introduce sustainable argo-forestry practices in a woodland I have upstate—I avoid the word “own,” because trees make the word small and foolish (outside of a court of law). Michael T. Young: Thanks for your time and thoughtful responses, Richard. Let’s close with your favorite poem from The Tide of a Hundred Mountains. one of the young women at the bar said. history – we knew what we lived. Jake asked the talkative one. “Did you ever kill anyone?” he asked her. She did not know where to look. I shook my hand to wave him off. leaning in too close, no less loud. and turning back to the women. so the bartender would know he’d be back. more than their own time. all of us forever bound to brothers. even if he comes back. of the Brooklyn Inn, late, on that cold winter night. alive with their own shadows. for us anymore. It’s just us out here, just us. and with no more than a nod walked out. A Tide of a Hundred Mountains. Richard Levine. Many poets strive to marry aesthetic demands with a social conscience. It is a difficult marriage that many are only occasionally successful at. Richard Levine is consistently successful at this difficult balance. This is true of his earlier work as with his current collection, A Tide of a Hundred Mountains. This collection takes on the problem of how our desires betray us and often also betray the object of our desires. In the wake of that problem, the collection tries to find a way to reconcile us to those we love in spite of that betrayal. . . . . . . . . . . . . . . . . . . .will one day be like this. . . . . . . . . . . . . . . . . . . .he cannot feel what he holds.
. . . . . . . . . . . . . . . . . .than not.
. . . . . . . . . . . .where they will become lovers.
. . . . . . . . . . . .lived in a blue wood, so like ours.
. . . . . . . . . . . .to the most forest-deep secrets in each other’s lives. . . . . . . . . . . . . . . . . . . .to make the bed we made together. . . . . . . . . . . . . without disturbing the peace. . . . . . . . . . . . . beyond to sing amid the retreating spume? Our presence echoes into the future; what will be the lesson your presence leaves to future generations? This is a question about the bed we make together. . . . . . . . . . . . . at the couple’s back, between the trees, is black. . . . . . . . . . . . . white. Levine is a jazzman at heart and the kind of rhythmic fluctuations and surprises found in jazz are found in Levine’s poems. Like jazz, they are deeply felt and powerfully articulated, surprising and moving at the same time, while probing the deepest parts of our humanity.